He was the son of Thomas Gardner. 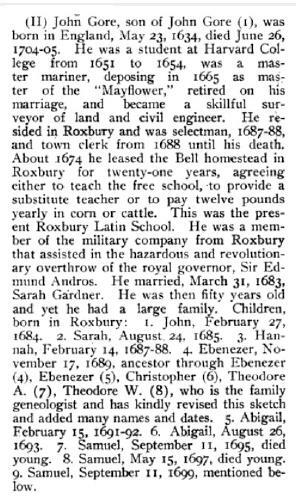 "Massachusetts Deaths and Burials, 1795-1910," database, FamilySearch (https://familysearch.org/ark:/61903/1:1:FH58-KXV : accessed 15 February 2016), Peter Gardner, ; citing , reference p 181; FHL microfilm 741,320. 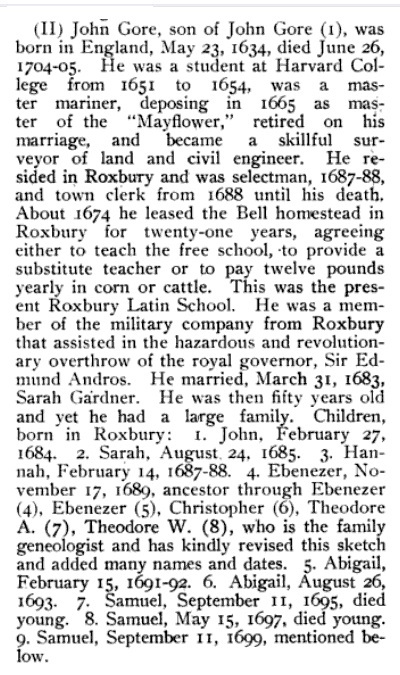 "Massachusetts, Town Clerk, Vital and Town Records, 1626-2001," database with images, FamilySearch (https://familysearch.org/ark:/61903/1:1:F4LG-XHS : 13 July 2016), Peter Gardner, 22 Jul 1684; citing Birth, Roxbury, Suffolk, Massachusetts, United States, , town clerk offices, Massachusetts; FHL microfilm 741,320. 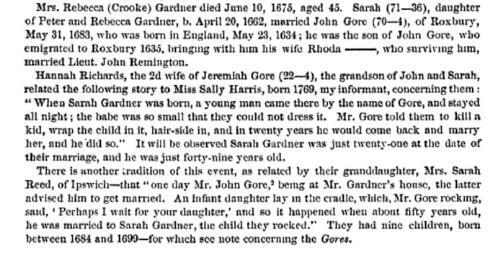 Rebecca W. Gardner died on June 3, 1848 in Dorchester, Massachusetts, at age 19. 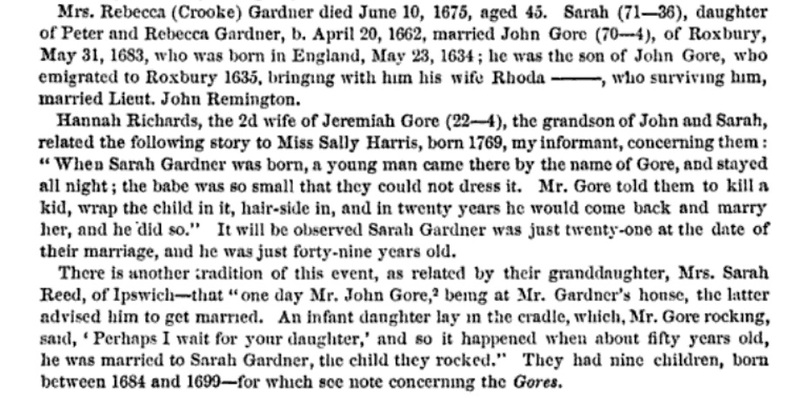 "Massachusetts Births and Christenings, 1639-1915," database, FamilySearch (https://familysearch.org/ark:/61903/1:1:F4L2-N46 : accessed 6 October 2015), Sara Gardner, 20 Apr 1662; citing Roxbury, Suffolk, Massachusetts, p 12; FHL microfilm 741,320. "Massachusetts, Town Clerk, Vital and Town Records, 1626-2001," database with images, FamilySearch (https://familysearch.org/ark:/61903/1:1:F4LL-52F : 13 July 2016), Sarah Gardner, 15 Mar 1674; citing Birth, Roxbury, Suffolk, Massachusetts, United States, , town clerk offices, Massachusetts; FHL microfilm 741,320.